The Lamborghini Huracan is new from the ground up. Changes from Gallardo included full LED illumination, a 12.3 inch full-colour TFT instrument panel, Fine Nappa leather and Alcantara interior upholstery, redesigned dashboard and central tunnel, Iniezione Diretta Stratificata (IDS, essentially an adapted version of parent Audi’s Fuel Stratified Injection) direct and indirect gasoline injections, engine Stop & Start technology, EU6 emissions regulation compliance, Lamborghini Doppia Frizione (LDF) 7-speed dual clutch transmission with 3 modes (STRADA, SPORT and CORSA), 20 inch wheels, carbon-ceramic brake system, optional Lamborghini Dynamic Steering variable steering system and MagneRide electromagnetic damper control. 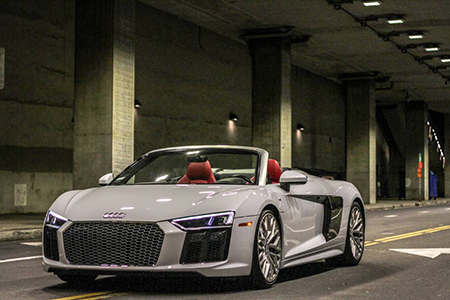 The vehicle was unveiled at the March 2014 Geneva Motor Show, and deliveries began in the second quarter of 2014. The Huracán is comparable to the McLaren 650S and the Ferrari 458 (as well as its successor, the 488 GTB). 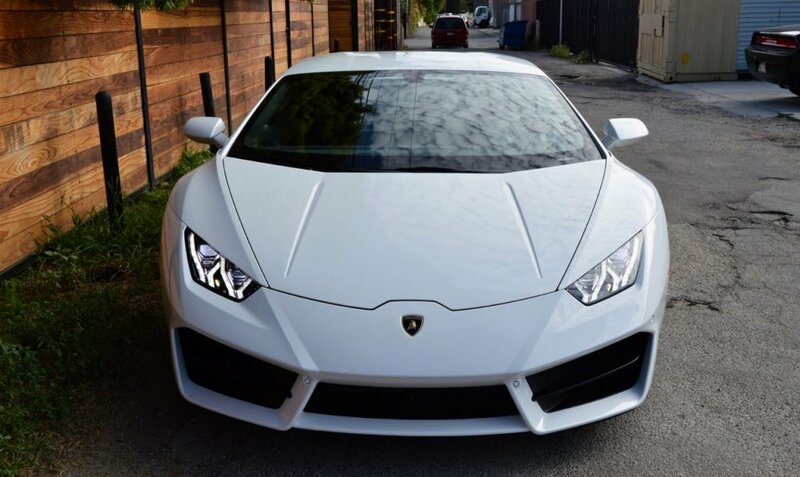 At 777 Exotics we offer the Lamborghini Huracan rental with a Best Price Guarantee and More Free Miles included. 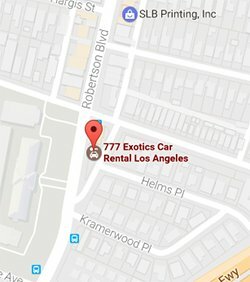 Call us today and book your experience with this thrilling car. Lamborghini Huracan’s top speed is over 325 km/h (202 mph). It can accelerate from 0 to 97 km/h (60 mph) in 2.5 seconds and from 0 to 193 km/h (120 mph) in 8.1 seconds. With a dry weight of 1,422 kg (3,135 lb), the Huracán has a power-to-weight ratio of 2.36 kg (5.20 lb) per horsepower. The Huracán has electronically controlled all-wheel drive, which aims to increase the traction on various surfaces and the overall performance of the car. 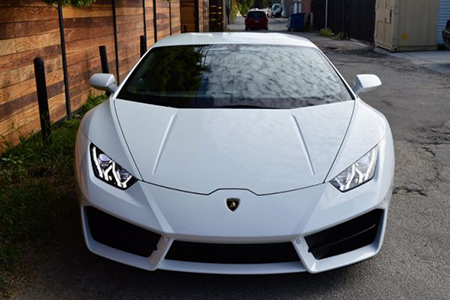 The Lamborghini Huracan is one of our favorite cars for Los Angeles. A true exotic car and a favorite design of all types of Lamborghini. Regardless of the year or model, a Lamborghini is anything but a regular daily driver. Every Lamborghini packs a well-crafted mix of style and raw power. Just like riding a bull, an powerful and extremely stylish beast. Resting under the hood, there’s a V10 heart capable of pounding 631hp to the ground via a 4-wheel drive system which makes the Huracan sprint to 100 km/h in just 2.9 seconds. While you easily realize the numbers could’ve been better compared to main competitor models from Ferrari and Porsche, it’s the hands-on experience where the Huracan really shows why the Lamborghini logo is a bull and not a petty calf. he Huracan fits the profile like a glove. Inside, the quality leather seats accommodate the driver from the rear and from the side. After glancing for quite a while at the hexagonal design cues brought over from the Miura, you can crank the V10 in the back via a jet-fighter like start button. Right after the push, the engine revs itself automatically, giving out an exhaust note to warm your ears for what there is to come. While it may be a good idea to let the tires warm up a little before punching on the throttle like a madman, the traction control system works without the slightest mistake no matter the conditions. It pushes the car up to 62 mph in just 3.2 seconds. At the bottom of the steering wheel there’s the Anima. By the push of a button you may switch between three driving modes: Strada, Sport and Corsa. When switching between driving modes, the ECU mapping, gearbox and suspension tuning and traction control settings are altered to fit the choice. Don’t expect to get high mileage in Strada (street) mode. The suspension does however soften up and absorbs bumps with a higher degree of confidence. On the other hand, Corsa (race) mode stiffens up springs and dampers so much you might actually feel your teeth being knock out. However, that’s just for a public road. Take it on the track and the experience changes dramatically. The gearbox transitions up and down the ratios without the slightest feedback getting into the cockpit. It’s rather uncomfortable that the paddles are attached to the steering column rather than the steering wheel. Having them turn along with the wheel would’ve given more control on edgy situations. With permanent 4-wheel drive and a slight tendency to understeer, the Huracan keeps it safe and doesn’t really let you go bonkers and try drifting sideways into a corner. Furthermore, the carbon-ceramic brakes provide a reassuring (and really stiff) brake pedal which will definitely throw you head-on into the dashboard if you’re not wearing the seatbelt. Finally, although the V10 could’ve sounded more like there are actually 10 cylinders in the block and the behavior at the limit could have seen more freedom, the Lamborghini Huracan brings on a beautiful experience. 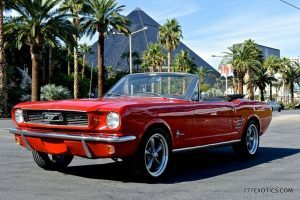 There are 610 horsepower at your disposal and ready to push through a greatly engineered all-wheel drive system that sends the car into Warp Mode.